By now you’ve met Claire and Jake and their houseguest Cooper James. 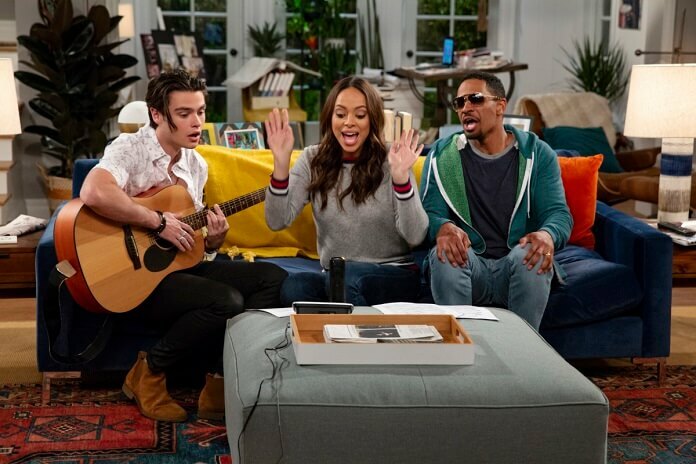 Jake (Damon Wayans Jr.) and Claire (Amber Stevens West) were just having a normal life when Jake’s client, rock star Cooper James (Felix Mallard) needed a place to stay. Now he’s turned their world upside down. They’re all still Happy Together though, in the CBS sitcom of the same name. We spoke with Stevens West over the summer, in mid-pregnancy, about her latest sitcom, and the legacy of her previous role on The Carmichael Show. Happy Together airs Monday nights on CBS. Do you have new respect for all of the sitcom actors who’ve hidden pregnancies on their shoes? Is it a relief to not have to be dealing with heavy themes and issues in every episode like The Carmichael Show? Amber Stevens West: “I don’t know that I feel like it’s a relief because I genuinely did love doing that. I loved talking about those subjects and I thought that that show was really smart, but it was hard to keep up with. Those writers worked really hard into late nights to really try to figure out what the voice was of every character. It was a difficult show in that sense but worth every struggle. If you had to have a rock star living in your attic, who would it be? Amber Stevens West: “Do I have to have a rock star in my attic? Oh, goodness. My first choice is no one lives in my attic because I don’t want anyone at my house. I’m such a hostess that I feel like anyone aside from immediate family, I have to entertain at all times. So, I would never be at ease having anybody in my house, even if it’s like my very best friend. What was it like to go from being the young couple on Carmichael to playing the older couple who stay in and go to bed early? Do you ever have that in real life when you’re around young Hollywood types who want to party? Do Claire and Jake have a healthy relationship? What does Claire do besides love her husband and play with the human Labrador? How does Cooper fit into this family? If your child wants to go into acting will you let them? If The Carmichael Show were still on, could you imagine what you’d be talking about? And #MeToo happened since Carmichael?